About the author THOMAS R. DeMARK and his impressive body of technical systems and indicators have been a major force at some of the largest and most successful trading operations in the world. In 1992, he formed Devan Capital with his partner Van Hoisington, of the multibillion dollar Hoisington Investment Management Co. He is the subject of an extensive profile in Futures and has appeared regularly on CNBC and other financial networks. The New Science of Technical Analysis He's been a most-valued advisor to such financial barons as Leon Cooper-man and Laurence Tisch. He and his models have shaped the investment strategies at some of the largest and most successful trading operations in the world, including Tudor Group, Odyssey Partners, and Warburg, Pincus. His word is gold among decision-makers at such investment giants as Goldman Sachs, Citibank, Discount Corp., and Criterion Fund. Now, at last, Thomas DeMark has decided to go public and share with traders and investors everywhere the proven forecasting techniques that have made him one of the most potent behind-the-scenes forces in the financial world. 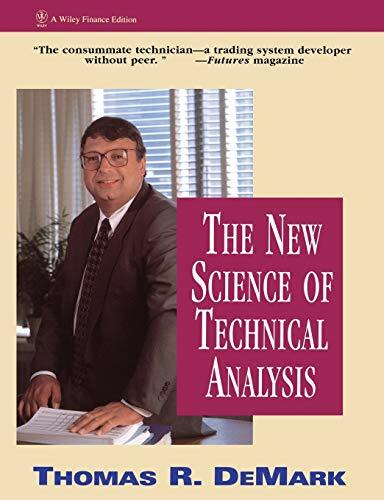 In this, his long-awaited first book, technical analysis guru Thomas R. DeMark describes the sophisticated market timing models, which he developed over the course of nearly a quarter century, devoted to the study of market trends and forecasting techniques. Rigorously scientific, rather than "artistic" or intuitive, the empirically based approach DeMark describes eliminates the reliance on gut-feelings and guesswork and serves as the rational foundation for dynamic systems that mechanically generate buy and sell signals. Proven to work with every type of market and all forms of data, these systems, along with a number of new and highly effective indicators which he introduces for the first time in this book, will dramatically improve your trading capability and versatility. Written for readers of every degree of technical sophistication, The New Science of Technical Analysis progresses in difficulty from the basics of how to draw a trend line, to high-level discussions of the subtleties of the latest enhancements to popular indicators. Hence, while it arms the seasoned professional with a retinue of new and exciting tools which can be quickly integrated into his or her current analytical toolkit, the scientific approach to chart analysis it describes provides beginners with a solid foundation upon which to build a high order of trading research expertise. The first book to reveal the technical secrets behind one of the most potent forces in finance today, The New Science of Technical Analysis is sure to be ranked among the rare handful of books that irrevocably transform the way business is done around the world. 7. The New Science of Technical Analysis [Paperback] DeMark, Thomas R.